SQUIDALICIOUS: Crime, Punishment, and a Toca Boca Event! Crime, Punishment, and a Toca Boca Event! an at-that-time unreleased TocaBoca app. Hey locals, Toca Boca's co-founder and CEO Bjorn Jeffrey is in town tomorrow, giving a workshop at Community Gatepath! Details below, and you should go. Because Bjorn is a great guy, Toca Boca is a great apps company (I've even written guest posts about autism for them), and GatePath is a fantastic org. But before I give you the event details, I want to tell you a little story about Bjorn, and Mali. 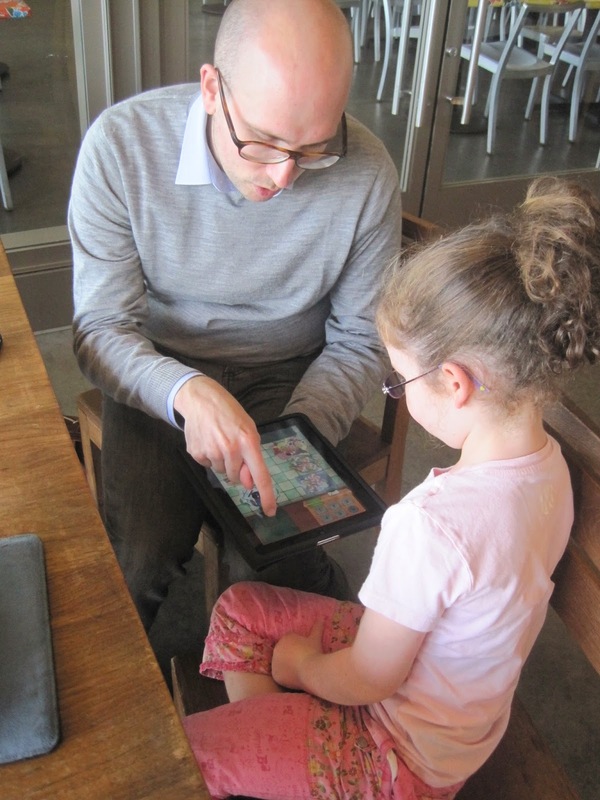 In 2011, Toca Boca apps were among my kids' very favorite iPad distractions (they continue to be much-beloved). Mali loved Toca Hair Salon. Leo loved Toca Tea Party. And I blogged about how much my kids loved those lovely, beautifully designed apps. One day, in late 2011, I received an email from Mr. Jeffrey, letting me know that he was going to be in San Francisco, and would I care to meet up? I said I would. We planned to meet at the Ferry Building. I told my kids. They were jealous. And then the day before the meetup, which happened to be my birthday, I got a call from Mali's school. I needed to come pick her up because she not only had punched another kid, but had informed the kid that any tattling would bring additional physical retribution (the kid tattled anyhow, and claimed asylum in the school office). The school didn't take kindly to premeditated assault among second graders, which I understood. They also suspended her for the next day, which I did not understand -- how is getting to miss school a punishment, again? To add to the not-aversive nature of her "punishment": as I did not have a suspension-day sitter for Mali, so she got to come with me to meet Bjorn. Who was gracious and informative, and gave our girl all sorts of demos of yet-to-be-released apps like Toca Kitchen -- which Mali played with while Bjorn and I talked about the intentionally non-text-based, exploration- & play-oriented design of TocaBoca apps, and why their design approaches makes their apps so well-suited to both international and special needs markets. Free fun giveaways to be presented to all participants and attendees will have a chance to win Toca Boca t-shirts, posters, and monster socks. Childcare is available -- RSVP to indicate if you will be needing childcare to clocke@gatepath.com or 650-259-8544.